I’ve been having lots of fun lately in my new role in Integration Engineering. It is also good to have someone local once again to bounce ideas off. Right now, that person is Paudie O’Riordan (although sometimes I bet he wishes I was in a different timezone 🙂 ). One of the things we are currently looking at is a VSAN implementation using Fusion-io ioDrive2 cards (which our friends over at Fusion-io kindly lent us). The purpose of this post is to show the steps involved in configuring these cards on ESXi and adding them as nodes to a VSAN cluster. However, even though I am posting about it, Paudie did most of the work, so please consider following him on twitter as he’s got a lot of good vSphere/Storage knowledge to share. After installing the cards, make sure that the ESXi host can recognize them. Use the ESXi shell command lspci -v to check (you can click on the images to make them larger). 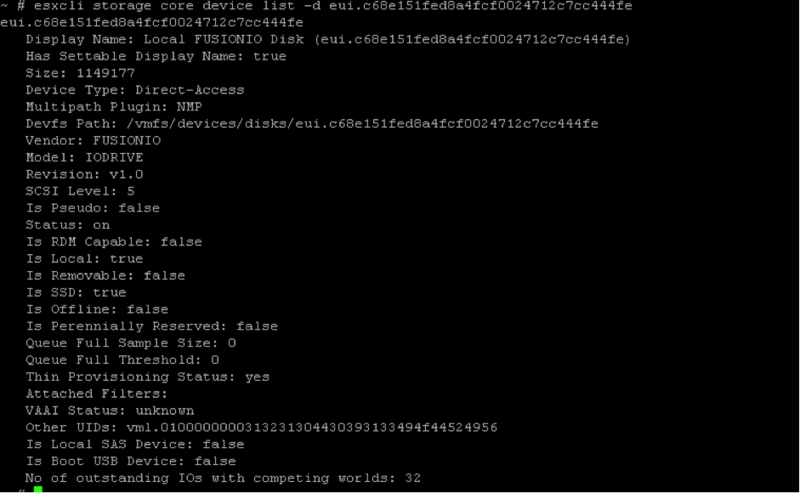 Take note of the DID/SVID/SSID of the controller as this will be needed when sourcing the driver for the card next. In this case, it is 1aed:2001. The VCG/HCL displays enough information to verify the adapter type from the lspci output captured previously. Compare the DID/SVID/SSID listed and ensure that this is the correct driver for your controller. The driver installation looks good. The adapter is visible and the device is available. Now you are good to go. You can now build your VSAN disk groups using Fusion-io IODrives as your flash device, and create your VSAN datastore for virtual machine deployments. Great post. I did want to make a quick comment on the fist section regarding about ESXi not shipping with a driver. 5.5 Rollup 1 actually does have our drivers and utilities pre-installed, so there’s not need to do any of that. It’s always a good idea to check the firmware, but you could pretty much skip to Section 6. You are correct. The ESXi 5.5.0 Driver Rollup 1 contains the driver. However this is designed for fresh green field installations of ESXi hosts. To apply the driver to existing ESXi hosts, you would have to go the procedure highlighted here. 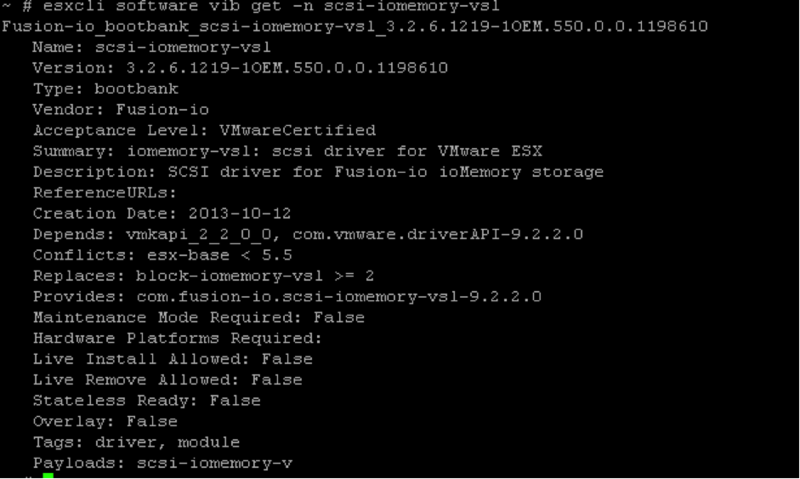 Pingback: Getting started with Fusion-io and VSAN - VSAN Me!